Love this pack of 10 Chiffion Headbands with Flower for $9.17 + FREE Shipping! That is a great price making each only $.91 each! Not many reviews but a solid 5 stars! Perfect for the Easter Basket! Head to Amazon to purchase your set of 10 Chiffion Headbands with Flower! Find more Amazon Deals and how to get FREE shipping with Amazon Prime at Frugal Coupon Living! Here’s a great thing for the beginning of a new school year! Join 3M Post-it and help raise $25,000 for AdoptAClassroom.org by sharing a note on how you’ve helped make someone’s day! Just click on the banner above and share how you’ve encouraged someone using a Post-It Note! For each note you share, Post-It will donate $1 to AdoptAClassroom.org, up to $25,000! So share your note and help Post-It and AdoptaClassroom.org! This is a pretty sweet shirt. 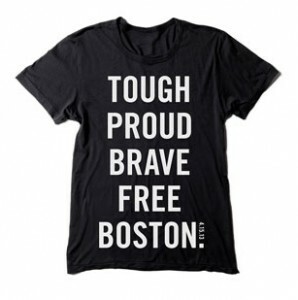 Check out the American Apparel Women’s “Honoring Boston” T-Shirt in Men’s and Women’s Sizes for $20. All net proceeds from the sale of this Honoring Boston tee to the Emergency Medicine Fund at Massachusetts General Hospital, which supports the patients and families affected by the Boston Marathon tragedy. Grab small, medium, large, and XL in both genders. Head to Rue La La for a look. It is FREE To join, there is no commitment to buy in the future. High Value $2 coupon from Jose Ole + FREE $2 Donation to CMN! Print this coupon for $2 off Jose Ole products and they’ll donate $2 to Children’s Miracle Network Hospitals! Love that you get to give while saving money too! Print yours and you’ll help them reach their goal of donating $100,000! Pay it forward when you accept Kind Bar’s new Kinding Mission! Just watch a short video from Kind Bars and click “Yes, I’ll Do It” tab to enroll. When you do, you can invite up to two of your friends to support this mission too and they’ll get a FREE Kind Bar in return! They have different missions each month. If enough people accept this KINDING Mission, KIND will partner with Joyful Heart Foundation to package and deliver healing kits to hundreds of children at Child Advocacy Centers across the country – helping to bring them comfort and support on their first night away from home. How Kind! They are 68% of the way there, so pledge to do something so they can meet their goal and help these kids! *Valid only for email addresses not yet registered in this month’s KINDING Mission acceptance list. Invitation must be sent to a recipient who has not received this offer from you or any other sender at any previous time. Valid only for shipping to United States and its territories. Every time someone watches the video (until TODAY August 18th), Jimmy Dean will donate $5 to Share Our Strength in support of the No Kid Hungry campaign. Pay it forward, donate $5 just by watching myself with the sun! Disclosure: Together with Share Our Strength, the Jimmy Dean® brand has joined the No Kid Hungry® Campaign, working to end childhood hunger in America by 2015. For every view this video receives now through August 18, 2012, Jimmy Dean will donate $5 to Share Our Strength (up to $5,000). This is in addition to the brand’s annual commitment of $150,000. Every time someone watches the video (until August 18th), Jimmy Dean will donate $5 to Share Our Strength in support of the No Kid Hungry campaign. UPDATE: This company has revived more funds! Now when you spend purchase a Tee, tote or anything for $21 and they will donate $21 to families of those affected by Autism! The mission of Sevenly is to raise capital and awareness for the world’s greatest causes. Each week, they partner with a different charity. 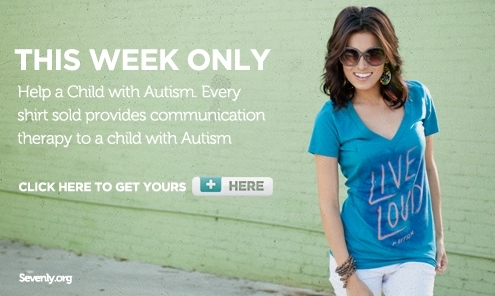 For each t-shirt purchased, Sevenly will donate $7 to the week’s cause. Their shirts are cute too and look very comfortable!